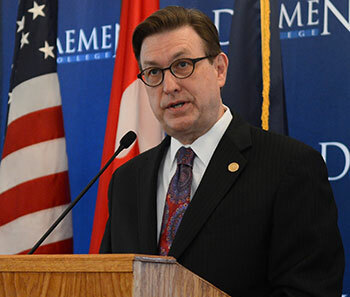 AMHERST, N.Y. -- Daemen College President Gary A. Olson has been appointed to the National Collegiate Athletic Association’s Division II Presidents Council, the body that helps set policy and the strategic direction for all Division II colleges nationwide. The council is composed of 16 presidents or chancellors of Division II colleges across the country. Olson, who has a national reputation as a scholar, columnist, and college administrator, will serve a four-year term as a council member. After a three-year-long probationary period, Daemen was approved in July to become an active member of Division II beginning in September. The college will be a member of the East Coast Conference and will compete against such colleges as the University of Bridgeport, Molloy College, Queens College, and the University of the District of Columbia.